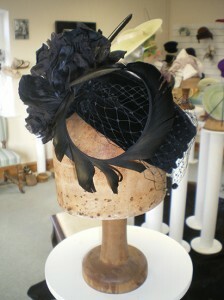 This is the back of a small black velvet pill, worn at an angle and with it’s hard shape softened by merry widow spot veiling, silk & velvet flowers, and a curled feather. Just, well, a classic, really; it is a formal look but easy to wear, and non-intrusive… lets say subtle elegance rather than one-upmanship! It is easy to get distracted at present as my studio window overlooks the river Tone, at, perhaps, it’s widest point. The river is forever busy with ducks gossiping, fighting and busying themselves with something or other, in the present season it’s generally a bit of the other… There are also the new swans vying for female attention and territorial rights, presided over by the elders, not to mention the local inhabitants gathering at the nightclub over the water… it is a wonder I get anything done sometimes! This is a pretty little hat blocked in buckram over a crown block from 1948 (I guess this as there is newspaper pushed into the spinner hole with this date on it, but the style certainly suggests so). When making small hats I like to vary the textures and add more elements (large hats=simple trims, small hats=go mad) as I am trying to create a striking style not relying on sheer size and volume. 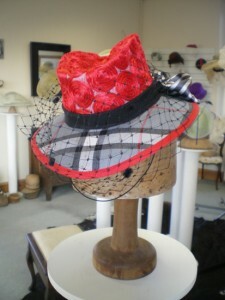 The crown is ribboned net, with a wool tartan brim, spot veiling, and, although not prominent in this picture, a striped silk wired ribbon trim to the back. Wired ribbons are huge fun, therein you can create form with surface pattern and can manipulate it to taste. Any fabric can be used, so there is potential to incorporate one’s outfit if it appeals! Again; wired silk fabric forms a bow at the back of this delicate tilted pill. I have also used a couple of spines to give it accent, it is worn perched over one eye, and although small, is very stylish. 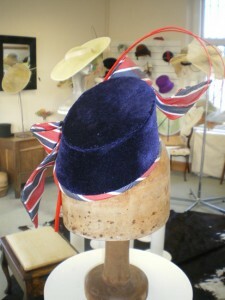 I may wear it on the Queen’s Jubilee. I have spent most of today making an enormous dragonfly headdress using willow as a base structure. It is an experiment towards my three day teaching at a school next week where I will be attempting to coerce a class of 10 yr olds into making carnival ‘Butterfly Ball’ headdresses… good luck me! Photos to follow.